FACTORY SPECIFICATION INCLUDES: – G50 5-SPEED MANUAL GEARBOX, METALLIC PAINT, LEATHER SEATS FACINGS, SPORTS SEATS WITH ELECTRIC HEIGHT ADJUSTMENT, ELECTRIC SUNROOF, ELECTRICALLY ADJUSTABLE DOOR MIRRORS, SPORTS SHOCK ABSORBERS, LIMITED SLIP DIFFERENTIAL, FORGED ALLOY WHEELS WITH COLOURED CRESTED CENTRES, REAR WIPER, HIGH FIDELITY 8-SPEAKER SOUND SYSTEM WITH AMPLIFIER, REAR SPOILER AND LIP SPOILER, LUGGAGE COMPARTMENT TRIMMED IN BLACK VELOUR CARPET. 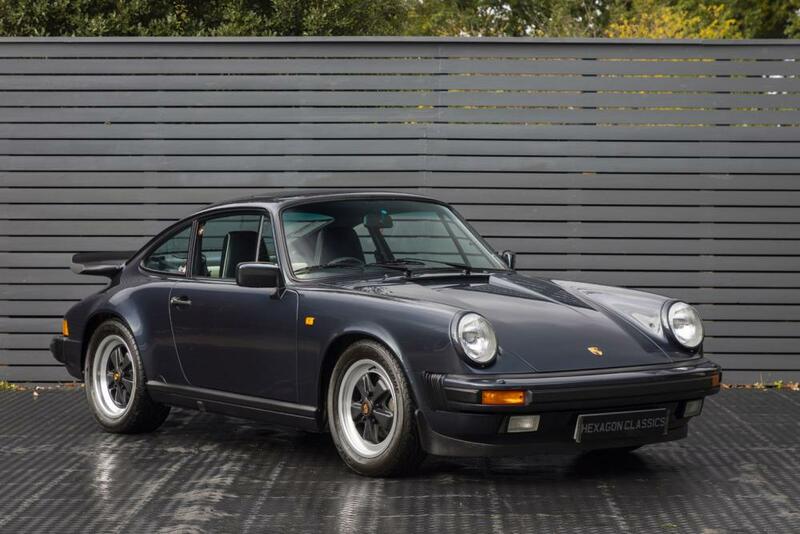 Hexagon Classics are delighted to offer what must be one of the lowest-mileage examples of the fabled 231 bhp air-cooled Porsche 911 Carrera 3.2 Sport Coupe. It is presented in a classic colour combination which further enhances this Porsche collectors’ proposition. The car is offered on behalf of one of our established clients, who has fastidiously maintained the car within their collection. The last-of-the-line in traditional Porsches, these Carrera 3.2’s are the best way to deliver the famous air-cooled old-world Porsche driving experience. Evoking a more exciting time before power steering and other driving aids altered modern Porsches forever, this Porsche offers an authentic driving experience that made Porsche 911’s legendary. This Porsche Carrera was originally supplied on 16/06/1988 by the British Rally Champion Roger Clark’s Porsche dealership in Narborough, Leicestershire. Boasting a tremendous history file full of invoice for works, the Porsche also has a raft of historic MOT certificates and road fund licence discs to substantiate the incredibly low genuine mileage. The service booklet has been regularly stamped by Porsche Centres and leading Porsche specialists. The original Porsche book pack is complete with driver’s manual, service handbook, Hamilton & Palmer alarm documentation and red programming key. A real opportunity to secure one of the best examples of a 911 Carrera 3.2.